Castelli Romani is the aggregate concept of Roman fortresses that were once built as small towns for wine production in the hills surrounding the south-east of Rome. These smalltowns and villages are scattered over the wooded slopes of the Alban Hills. One of these palaces is Gandolfo Castle, known today as the summer residence of the Pope. Gandolfo Castle is located just 15 miles from the Italian capital Rome, and can be reached most easily by the subway station - Anagnina or by train from Termini Station. Gandolfo Castle offers a splendid view of the Lake Albano, which remains slightly downhill. Travelling by train from Rome to Gandolfo is extremely picturesque and allows passengers to enjoy the spectacular views of the nature of the local Italian region. Gandolfo Castle and the fabulous village around it were often visited by Pope John Paul II. 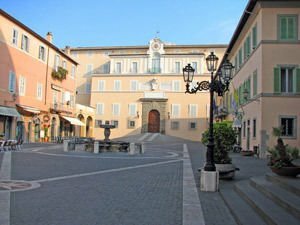 And one of the first things that his successor Benedict XVI did was to thank the residents of Gandolfo and assured them that he will spend his summer holidays in the beautiful small town above Lake Albano. Only Gandolfo Castle dominates the charming small square of Liberty or Piazza della Libertà. Gandolfo Castle is attached to an astronomical observatory and the gardens extend to a much larger territory. Much of the houses in the village are owned by various religious foundations and the whole town is located at 136 acres, which is 27 acres more than the area of the Vatican. The settlement includes a palace, Gandolfo Castle , two monasteries, one school, farms, gardens and an observatory of the Vatican . The first pope who used Gandolfo Castle summer residence was Pope Urban VIII Barberini. As a cardinal he loved to spend his summer holidays at the castle and the first time he used Gandolfo for his vacation was in the summer of 1626. Just over 8000 people live in the small town above Lake Albano. Its exceptional beauty and natural scenery around it are classified as one of the most beautiful villages in Italy. Around the lake there are many private villas and houses built from the 17th century. The very name of Gandolfo Castle comes from the Latin Castrum Gandulphi, assuming that the name comes from the former owners Gandulphi, who were born in Genoa .